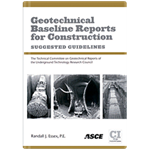 Geotechnical Baseline Reports for Construction: Suggested Guidelines examines the role of the geotechnical baseline report (GBR) as a means of allocating and managing risks associated with subsurface construction. The document discusses the rationale for the use of GBRs as a risk-management tool, the organization and content of a GBR, and the importance and benefit of ensuring compatibility between the GBR and other contract documents. This publication, prepared by the Technical Committee on Geotechnical Reports of the Underground Technology Research Council, expands on the previously published Geotechnical Baseline Reports for Underground Construction: Guidelines and Practices. It includes three new chapters on the application of GBRs to other types of subsurface projects, the application of GBRs in design/build project delivery, and recommendations based on industry-wide lessons learned. The document also addresses owners' perspectives and the importance of having experienced individuals involved during GBR preparation and review.